MegaDumper™ Bin Tippers provide a heavy-duty industrial solution for emptying large bins at weights of up to 1,323 pounds (600 kilograms). The MegaDumper™ is based on the proven design of the Simpro Dumpmaster™ and is one of the most reliable, safe, and easy-to-use industrial bin tippers available. The MegaDumper™ comes standard with a suite of safety features including full-cage guarding. The MegaDumper™ uses an ultra-reliable electro-hydraulic mechanism, which means managers don’t have to worry about costly upkeep and repairs. This Bin Tipper has a fully galvanized frame and cradle making it suitable for both indoor and outdoor use. Optional full or partial stainless-steel construction is available for corrosive or hygiene-critical environments. The MegaDumper™ comes with an impressive array of features to keep operators safe. Besides the full-cage guarding, this state-of-the-art Bin Tipper also has safe cradle lowering, a door interlock system, a cradle interlock system, and a suite of optional features for enhanced safety. The best part about the MegaDumper™ is that it’s fully customizable. A custom MegaDumper™ can be modified to empty bins of unusual sizes or shapes. Call our sales team at 1.800.BHS.9500 to find out how a MegaDumper™ can improve safety and efficiency in industrial settings. Available for mains-powered bin tippers to enable operators to leave the machine to complete the cycle unattended. Secure the tipper to a bin or skip. For use in hazardous areas. Operator controls can be mounted anywhere on the machine or remotely to suit productivity or safety requirements. Dual-hand controls are also available to prevent the operator from engaging in other interactions. Platform scales fit under the cradle to enable product to be weighed before tipping. Foot guards prevent operators’ feet from going under the machine frame. A guard panel is available for the front for additional protection. Note this face is normally up against the bin being tipped into. Unbreakable plastic guarding can be fitted adjacent to operator controls for protection when tipping liquids or harmful materials. Unbreakable plastic guarding panels are available in place of the standard 1” x 1” (25 mm x 25 mm) wire mesh cage. Battery-powered bin tippers being used outside can be fitted with a solar panel. Depending on the amount of direct sunlight available, up to two tons can be emptied per day using solar power alone. Powder coated steel bucket cradle includes adjustable hoop retainer and adjustable packer blocks. Bolted to the main tote cradle plates, the Bucket Cradle accommodates all tubs that fit within 27” wide (686 mm), 24” deep (610 mm), 47” high (1194 mm), including all standard steel drums and BRUTE® Bins. 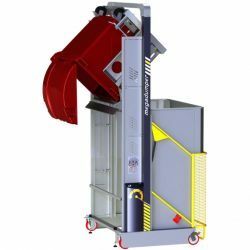 Frame-mounted tipping chute is available for situations where the machine cannot be flush with the bin or hopper. Note the tipping height may need to be increased to accommodate the slope of the chute.